Fall colors have begun their annual migration from northern New England to points south—and so here’s my annual updated list of resources and tips for finding foliage nirvana this autumn season. This year I’ve organized them in a rough timeline to help you identify the best places to find peak foliage depending on when you visit. First, to get temporally oriented, it’s worth getting a quick overview of where and when foliage typically peaks across New England by taking a look at this great animation from Yankee Foliage (one of the most comprehensive sources of info for all things New England foliage), or this New England foliage map from Boston.com. State-specific information is also available for New Hampshire and Vermont. 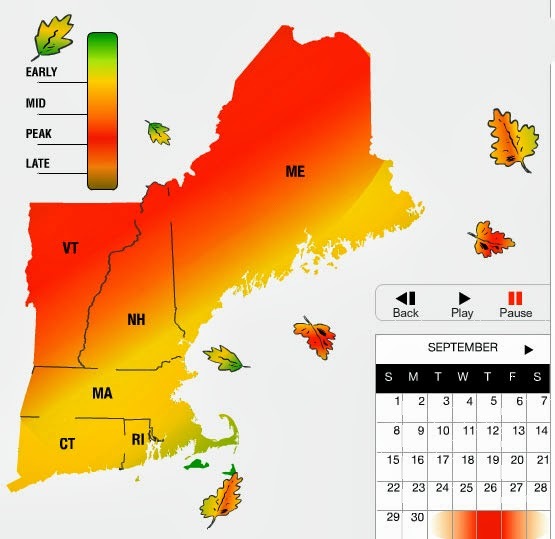 For New Hampshire, the state’s Office of Travel and Tourism produces this interactive map of likely foliage conditions by date. For Vermont, there’s this excellent animation of foliage progression from Foliage Vermont. Typical foliage conditions, early October. Screenshot from the interactive foliage map on Yankee Foliage. This is the time to head to the northern reaches of New England. Regions north of the Presidential Range in New Hampshire, especially the Kilkenny-Pilot Range in the Berlin area, typically blaze in full glory during this period. Check out the New Hampshire foliage reports for the latest. In Vermont, strike out for the Northeast Kingdom in the far northeastern corner of the state. For the most recent reports, check out the Vermont Department of Tourism and Marketing’s Fall Foliage Central site. Fall foliage peaks across the broadest swath of New England. This includes most of Vermont; New Hampshire from the central White Mountains south, except areas along the southeast seacoast; central Maine, including all of the state’s mountains south and west of Katahdin; the Berkshires of western Massachusetts, as well as higher elevation areas in the central part of the state; and some hilly, higher elevation pockets in northwest Connecticut. For hikers, I recommend the following destinations during this period, ordered here in rough chronological order of when peak foliage is likely to occur. For more on southern New England opportunities, check out the foliage site from the Massachusetts Office of Travel and Tourism or the fall foliage report from the Connecticut Department of Environmental Protection. Peak foliage reaches its end in New England. Essentially all high-elevation destinations will be past peak by this point, and only low-elevation areas along the region’s seacoast and spots across eastern Massachusetts and southern New England still offer opportunities for maximum leaf-peeping. For hikers, I recommend the following destinations, again in rough chronological order. May the foliage be with you!